The 15:17 to Paris (film, 2018). A 2018 American biographical drama film with "PG-13" rating by Warner Bros. Pictures. Directed by Clint Eastwood. Official Trailer. The 15:17 to Paris is a 2018 American biographical drama film directed by Clint Eastwood. 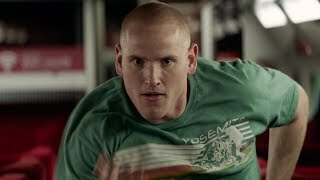 THE 15:17 TO PARIS - Official Trailer . Spencer Stone and Alek Skarlatos are attending a suburban Christian middle school. They bond over their interest in guns, and are often sent to the principal's office for disciplinary action. Once, while sent to the principal's office, they meet another student, who often misbehaves in school, Anthony Sadler, and the three become friends. Spencer and Alek are from single mother homes, and their mothers often stick up for them when called to the principal's office regarding their misconduct. While working part time at a smoothie shop, Spencer waits on a recruiter for the United States Marine Corps. He asks the recruiter what military branch he would select if he could go back. The recruiter replies that the Air Force pararescue save lives and "seem to being doing fine work in the field." Spencer is intrigued and decides that he wants to join up. So he begins working out to lose some extra weight. After several months of rigorous training and exercise, he gets into much better shape and enlists in the Air Force in hopes of becoming a Pararescueman. Upon completing basic training, Spencer takes his exams to qualify for pararescue school. But having poor depth perception, he is turned down. Upset, he chooses from the other Air Force options left to him, and is soon stationed abroad. His friend, Alek, enlisted in the Army, and has been deployed to Afghanistan. On Skype, Alek tells him that he is planning to visit his girlfriend in Germany, and the two decide to rendezvous there for their next leave. Spencer skypes Anthony, now a college student, and talks him into coming to Europe for a vacation, visiting Italy. Afterwards, the three meet in Germany and decide to go to Amsterdam. After a few days there, they finally decide to visit France after deliberation. They depart from Amsterdam Centraal station on the 15:17 train to Paris. The film The 15:17 to Paris was scheduled to be released by Warner Bros. Pictures on February 9, 2018 (United States) and on April 19, 2018 (Germany). The duration of the film is 94 minutes. With a budget of $30 million, the film grossed over $57.1 million. The 15:17 to Paris got low rating from critics. The audience dislikes the film either. Audiences polled by CinemaScore gave the film an average grade of "B-" on a scale ranging from A+ to F.